Poverty: the norm of the third world and the scourge of the first. 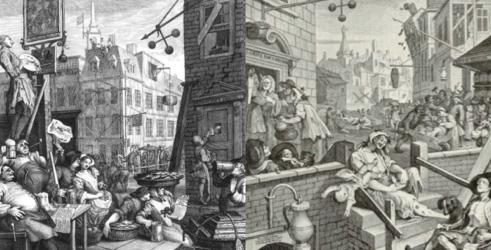 In Britain, it conjurers images of economic deprivation, homelessness and empty plates. But what does the term ‘underclass’ bring to mind? Is it an image of extreme poverty? An image of a life akin to that led by Diogenes? For most, it’s a difficult term to define. It is the product of Charles Murray, an American political scientist whose definition of the term was that it referred not to a degree of poverty, but a type of poverty. This ‘type of poverty’ was not defined by wealth or general lack of economic capital, but more specifically by behaviour, social position, education and single-parenthood. In essence, Murray’s definition laid the blame for the underclass with the welfare system which he characterised as over-generous, allowing a group of what were, in his mind layabouts and drop-outs to sustain themselves without the necessity to find a way out of their deprivation. Now, this is a hotly debated topic, and I have no intention of getting drawn into the debate surrounding Murray or his theories of the underclass. Rather, I wish to re-appropriate his term ‘underclass’, define it in a different way and show how in fact, the problem is very much one of economics rather than social or cultural deprivation. My definition of the new modern ‘underclass’ is of, as Murray argues a type of poverty not categorised by social factors, but fundamentally economic ones. My argument is that this ‘underclass’ is a group whose poverty is the result of an economic system and policy which by its very nature disadvantages them. It is not, as Murray argued the result of the welfare system propping them up and allowing them to survive, but of an economic policy forcing them down and thus perpetuating their ever elongating miserable existence. Two examples will suffice to demonstrate how our current economic policy acts as it does, or at least has the potential to force people into an economically-deprived underclass. The first is the elderly, or more specifically those without private pensions to rely on. This group has always been one of the most disadvantaged by the economic policy and system of the past decades, relying in many cases entirely on the state to support them in their old age; but the state and its policy has routinely failed them. These people are not part of the underclass because they are socially-deprived or simply lazy; on the contrary, most have worked all their lives, often in the public sector and have always done the right thing; ‘no one in their right mind believes that this group has volunteered for membership’, as Frank Field put it. Yet, so many live in abject poverty which has even been known to kill. They are poor because the economic policy, particularly of the past 7 years has brought the axe down hard on this section of the population. Councils, whose responsibility it is to care for these pensioners have seen such harsh cuts that most are now ‘at breaking point’ and simply unable to fund social services for elderly pensioners. Fuel poverty is at record levels among this group (1 million live with this Victorian affliction), as is the number who say they struggle to feed themselves, or have to chose between a warm home or a full stomach. And despite this, our economic policy continues to force them ever further into the underclass, or it at least has the potential to. The announcement in the Conservative Manifesto of the intention to scrap the ‘triple lock’, the system whereby pensions rise by either inflation, average earnings or a minimum of 2.5% depending on which is the highest is deeply troubling in relation to this group. Until now, this in many cases has been the only thing keeping many elderly pensioners with state pensions above water, and its removal could spell disaster. Ultimately, these people are and will be the victims of an economic policy and system fixated on economic growth for the sake of economic growth; money for the sake of money and profit for the sake of profit. Statistically, the economy may be growing, but most elderly pensioners, like many other members of our underclass do not feel its benefits because it is quite simply not orientated towards them. They are the victims of a policy which fails to recognise the reliance upon it of these people, who it swats into the dirt in favour of paper growth over real benefits: it forces these people into the underclass and it keeps them there. But what of our second example? This is a difficult one to define, and I do so by simply calling them working-class blue collar families, often with children. Now, here again economic policy has forced them into the ranks of the underclass; in many cases disproportionately effecting the children caught in the underclass ‘trap’. Between 2011 and 2015, 4.6 million people were recorded as living in ‘perpetual poverty’; and a large proportion of this group was, and still is low-wage family units. Over the past 7 years, they have been systematically deprived of vital state aid which has seen the number of children living in poverty rise to 3.7 million. Food-bank use too is into astronomical territory. Even those whom one would not associate with food poverty, yes that’s a real thing in 21st century Britain, like nurses are relying on the charity of others just to survive. Now, Theresa May famously tried to argue ‘there are many complex reasons why people go to food banks’. But, as many have very helpful pointed out, the main reason people have to use food-banks is because they can’t afford to eat and put food on the table for their families, as unbelievable as this is in modern Britain. And again, as with elderly pensioners, the economy may be statistically growing, but these millions fail to feel its benefits. 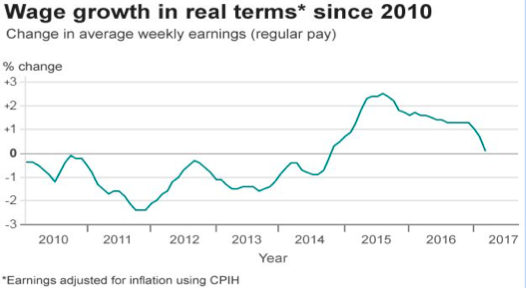 The inflation rate in April 2017 was 2.3%, but for the same period average weekly earnings adjusted for inflation and excluding bonuses stood at just 0.1%. The problem is plain; the economy is being fixed for the sake of fixing it. Inflation is rising, but house-building is not and a 300% increase in homelessness over the last 7 years is the result yet further adding to the ranks of our underclass. 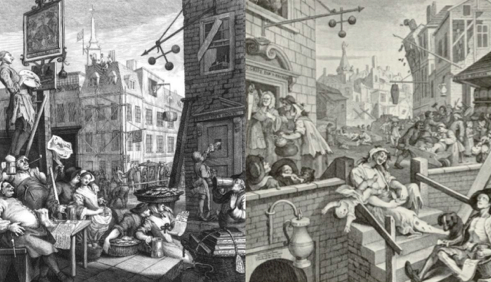 In places, Britain resembles something Hogarth would recognise. Current economic policy and its practitioners treat the poorest, our underclass, like lazy ‘proles’, failing to realize that in doing so they are making life worse for many thousands of already struggling people. The assumption that people are poor because they are too lazy to solve their own problems, and a general distain for the most vulnerable is all to clear. The removal of certain benefits from the unemployed for instance, a clear symptom of this ‘poverty is your own fault’ mentality has had a detrimental effect upon thousands, in so many cases bouncing the most severe consequences onto the poorest and most destitute children in our society. And, returning to this subject of children in our underclass, many of whose parents already rely on food banks and who routinely go to school hungry, the proposed removal of free school meals from many millions of poverty-stricken children has to be the last straw. No longer does our economic policy by its innate nature cause child poverty, now its actively trying to find savings by taking food out of the mouths of the most vulnerable: Its no longer simply enough to deprive poor children, now we have a policy which seeks to starve them as well. ‘Decrease the surplus population’; no doubt this will be the next conservative slogan!